Mediomics’ human immunoglobulin G (hIgG) assay kit can be used to quantitatively detect the concentration of hIgG in biological samples. Product applications include drug and vaccine testing, high- throughput screening of hybridoma cell lines, as well as quality control and detection capabilities for antibodies in production or research programs. 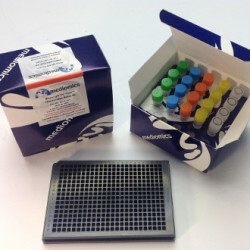 This kit is ideally suited for the rapid, simultaneous measurement of human IgG levels in large number of test samples due to its speed and simplicity. In comparison to the ELISA procedure, the TRF-PINCER® technology provides a simple (one mixing step) and fast (30 minute incubation) assay that is quantitative and reproducible. 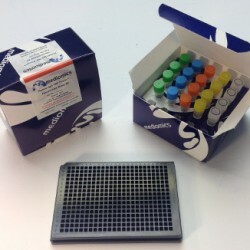 Mediomics’ mouse immunoglobulin G (mIgG) assay kit can be used to quantitatively detect the concentration of mIgG in biological samples. 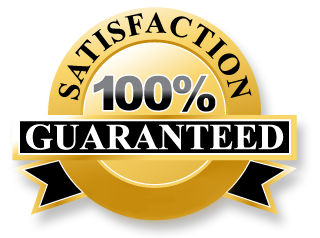 Product applications include drug and vaccine testing, detection of mIgG antibodies, and determining mIgG concentration. 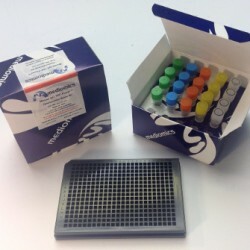 This kit is ideally suited for the rapid, simultaneous measurement of mouse IgG levels in large number of test samples due to its speed and simplicity. In comparison to the ELISA procedure, the TRF-PINCER® technology provides a simple (one mixing step) and fast (30 minute incubation) assay that is quantitative and reproducible. Mediomics’ mouse immunoglobulin M (mIgM) TRF-PINCER® assay is ideal for quantitatively detecting the concentration of mIgM in biological samples. Product applications include monitoring IgM antibody production, detection of mIgM antibodies, and determining mIgM concentration. This kit is ideally suited for the rapid, simultaneous measurement of mouse IgM levels in large number of test samples due to its speed and simplicity. In comparison to the ELISA procedure, the TRF-PINCER® technology provides a simple (one mixing step) and fast (30 minute incubation) assay that is quantitative and reproducible.